Poets are charged with creating works that are highly evocative. They use images that demonstrate emotions and ideas, either literally or metaphorically. Creative language is one of the tools that the best poets employ to get a point across. Among the most evocative choices is the use of onomatopoeia. This includes words that mimic the actual sounds we hear. For example, bark came about because it mimics the actual sound a dog makes. Also, a bell clangs in the night, also mimicking the actual sound. Let's enjoy some examples of onomatopoeia poems. 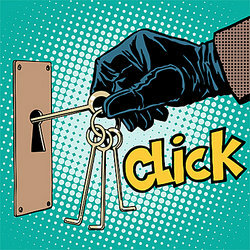 Onomatopoeia is often used by poets because it allows the reader to visualize the scene by creating a multi-sensory experience, all with words. Readers don't just picture the scene, they "hear" the sounds in the distance or "feel" the chill in the air - as these examples, from the classics to modern verse, demonstrate. Alfred Lord Tennyson was one of the most famous poets of the Victorian Era, succeeding the Romantic poet William Wordsworth as England's poet laureate. Lord Tennyson was widely known for his particularly effective use of language, which conjured up whimsy, mystery, and even sadness. Around the same time Tennyson wrote poetry in England, Edgar Allan Poe was doing the same in America. Poe's poetry is always filled with sensory detail, quite often unsettling and frightening. Here's an excerpt from "The Bells:"
A popular fairy tale widely believed to be true is the "Pied Piper of Hamelin." The piper supposedly led children away from their families in Germany during the Middle Ages. Gwendolyn Brooks was an American author who wrote during the years of the civil rights movement. As an African-American woman, Brooks experienced many of the trials and tribulations associated with being black during a tumultuous time in the history of the United States. She often poured these experiences into her poetry, which used sensory language to depict a variety of different ideas, scenarios, and stories. She later became Poet Laureate Consultant for her work. Carl Sandburg was so poor as a child, he had to drop out of school at the age of 13 to help support his family. Sandburg worked odd jobs until he was finally able to resume his education. Certainly, he rebounded because he went on to write volumes of poetry, two of which received the Pulitzer Prize. What do you think? 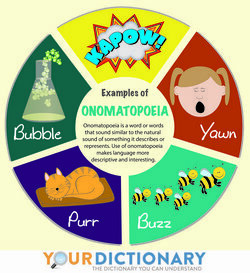 Are you ready to try your hand at an onomatopoeia poem? Or any type of poem for that matter? Enjoy this breakdown of the different types of poems. Then, then you're ready to spread your wings, review these writing tips and let your creativity fly. "Examples of Onomatopoeia Poems." YourDictionary, n.d. Web. 18 April 2019. <https://examples.yourdictionary.com/examples-onomatopoeia-poems.html>. Poets are charged with creating works that are highly evocative. They use images that demonstrate emotions and ideas, either literally or metaphorically. Creative language is one of the tools that the best poets employ to get a point across.Among the most evocative choices is the use of onomatopoeia. This includes words that mimic the actual sounds we hear. For example, bark came about because it mimics the actual sound a dog makes. Also, a bell clangs in the night, also mimicking the actual sound. Let’s enjoy some examples of onomatopoeia poems.